If you would have told me that finding a bed skirt would be the most difficult part of my bedroom makeover I wouldn’t have believed you. I thought I would just be able to pick up your run of the mill white skirt at any home goods store and be done with it. Nope. Of course not. Story of my life. I had to exchange 3 bed skirts before deciding I was better off making one on my own. Either they were too short, too long, too sheer, or the wrong color. Who knew?! 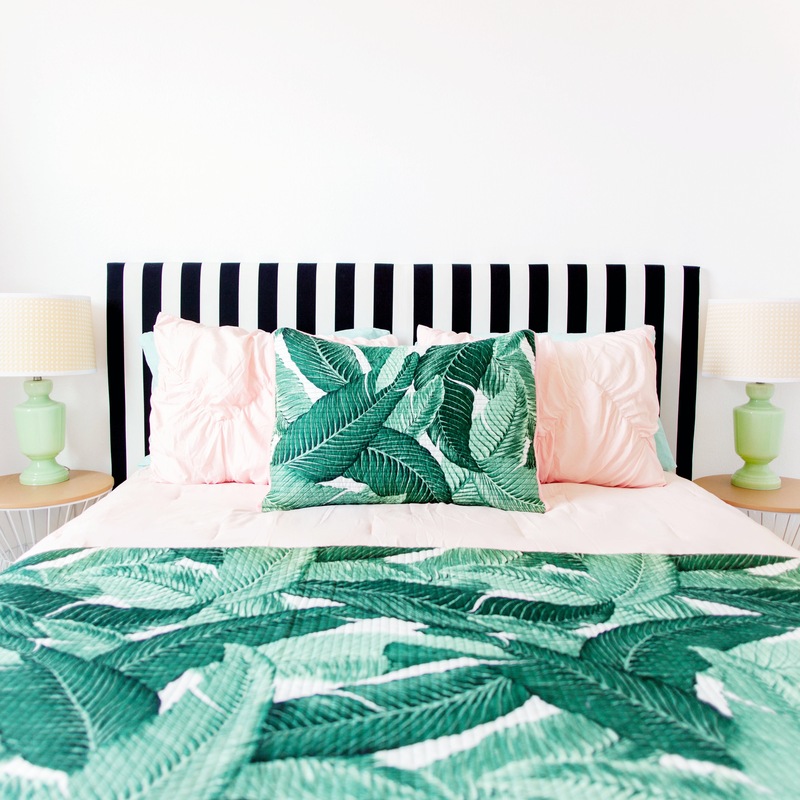 Luckily making your own custom bed skirt isn’t as hard as it may seem. First of all, I wanted it to match my new DIY headboard so I picked up the same striped fabric from IKEA. The headboard isn’t really new, it was previously used as the backboard to my dining room banquette IKEA hack. The fabric for the bed skirt cost me about $16, much cheaper than bed skirts I was finding in stores. The first thing you need to do is figure out how long your skirt needs to be. Measure the distance from the top of your box spring to the floor. Then add 3-4 inches for seam and stapling allowance. Mine was at 16 inches, so I cut 20 inch long strips of fabric. The fabric is 58 inches wide, so I needed 3 of these strips in order to cover 3 sides of my box spring. Next you need to make the hem. Fold over the long edge at 5/8″ and press. Then fold the raw edge under itself and press again. This creates a nice clean hem. Stitch at 3/8″. If you don’t have a sewing machine you can use iron-on hem tape. Once that is done, stitch the strips together at the ends to create one long strip. Then staple the raw edge directly to the box spring, making sure the hem just barely touches the ground. If you don’t have a staple gun you can use flat head tacks. Continue all around the box spring. The mattress should cover the staples and it’ll look like a normal bed skirt! Finally, make your bed as usual and reward yourself with a nice nap. For instructions on how I made the headboard, click here.